Q: Guruji, I want to stay at the Ashram. I feel I have taken care of my responsibilities and now I want to do sadhana, satsang and seva at the ashram. My relatives and in-laws are opposing my decision to join the ashram. Sri Sri Ravi Shankar: Do you know the whole world is my ashram! Wherever you stay will be an ashram. Moreover, I dont stay in one place, I keep traveling. I have come here after two months and I will be here for two weeks only. I keep going and coming and going again. You win over your relatives and in-laws with love. Do your sadhana and seva there and make your home an ashram. Keep coming here once or twice a year. If you tell them that you will go away to the ashram, they will become worried. They will feel, She is our daughter-in-law but she wants to leave the house and go. Dont do this, okay! Q: Guruji, why are there different customs in different religions? Sri Sri Ravi Shankar: Listen! Why should there not be? Why should everything be the same? God loves variety. He doesn’t want you to eat only potatoes. Otherwise he would have made only one vegetable in the world – potatoes. Variety is nature. Q: How did God originate? Sri Sri Ravi Shankar: First you tell me, where is the starting point of a tennis ball? Is there any beginning point? No! Similarly God is Anadi (without a beginning) and Ananta (endless). Q: Guruji, is life easy or difficult? In Buddhism, they say, The first truth is that life is difficult, and you say that life is joy. Which one is true? Dont tell me that both are right. Sri Sri Ravi Shankar: Why? I will say that only! Both statements are true. When a sad person feels that life is sorrow, if you tell him that life is joy, he will not be able to understand. He will only be able to understand that there is sorrow in life. However, as he progress in knowledge, then he starts to realize, Where is sorrow? Sorrow disappears as he progresses on the path of knowledge. The benefit of yoga and meditation is that it removes sorrow from your life. Then you realize the truth, that life is joy and you were unnecessarily worried. Whenever you have been worried in the past, wake up and see, you will realize that you were worried unnecessarily. How many of you have felt like this? Before you get your exam results, you worry so much. After the results are out, dont you feel that you unnecessarily wasted your time being worried? Everything came out well. By worrying, time is wasted and the mind gets disturbed. That is why it is said that when the event is over, only then we realize that worrying was unnecessary. Therefore, joy is the reality. Joy has always been a part of us, it is our nature. Worries just came like a cloud and then disappeared. Only that which remains unchanged can be called as the truth, just like how the sky is the truth and the clouds just come and go. Q: Guruji, Please tell us about the significance of ‘Janmashtami’. 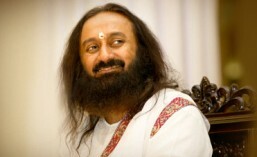 Sri Sri Ravi Shankar: Janmashtami celebrates the birth of Lord Krishna. Ashtami is significant as it indicates a perfect balance between the seen and the unseen aspects of reality; the visible material world and the invisible spiritual realm. Krishna’s birth on Ashtami signifies his mastery of both the spiritual and material worlds. He is a great teacher and a spiritual inspiration as well as the consummate politician. On one hand, he is Yogeshwara (the Lord of Yogas — the state to which every yogi aspires) while on the other, he is a mischievous thief. Q: Is there life after death? They say there are seven births. Are the seven births clubbed with the human birth or after human birth? Sri Sri Ravi Shankar: There is life after death. We will have to come back. We shall keep coming back. There is nothing like seven, it can be any number. Q: Guruji, what should a sadhak do to keep away from conflict? Sri Sri Ravi Shankar: Do sadhana, seva, meditation and pranayama. All of these practices are for that only. The more you do it the more it will help you to maintain your balance in times of conflict.